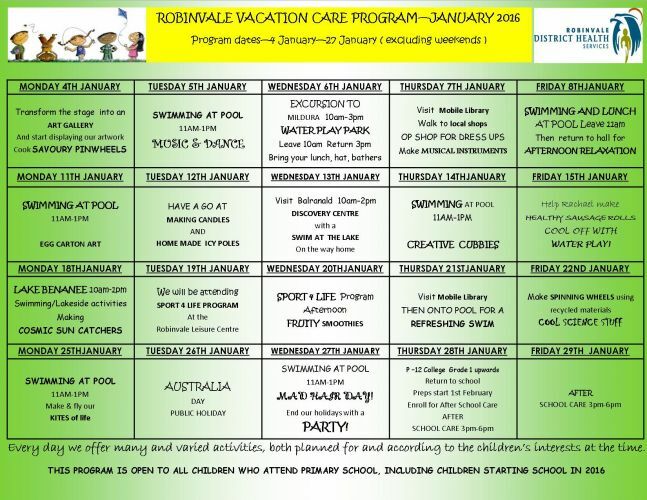 School holidays are here again and we are pleased to inform you that Robinvale District Health Services will again be running their EARLY YEARS VACATION PROGRAM. This program is open to all children who attend primary school. Our programs are conducted in a comfortable, relaxed and safe environment with experienced, qualified and caring staff interacting with the children on a group and individual basis. We offer many and varied activities, both planned and according to the children’s interests at the time. The Vacation Program is held at “The Hall”, 13 Watkin Street Robinvale. “The Hall” is opposite the St. Mary’s School and has green and purple shade sails outside. The program will be running from Monday 4th January 2016 to Wednesday 27th January 2016, from 8am-6pm, weekdays only during the Summer School Holiday Break, (excluding Public Holidays and weekends). Children will need to bring their snack and lunches, with the exception on the days where it will be provided, refer to program link below. Keep in mind our changeable weather and please provide appropriate clothing. Hats are worn when we are outside.